Tomorrow I go under the knife again. Hopefully this time it will fix chest pain I have had for years. I told the surgeon today that my body is a temple not a visitors center. Get in. Fix it. And get out!!! I’ll tell you what! This month at Farmington has been crazy fun. My friends are back! So here is a little teaser. A long time ago I remember sledding down my street with no snow on the street. We had plastic saucers that we sat on and sped down 2200 at a clip that could have broken bones. On asphalt. 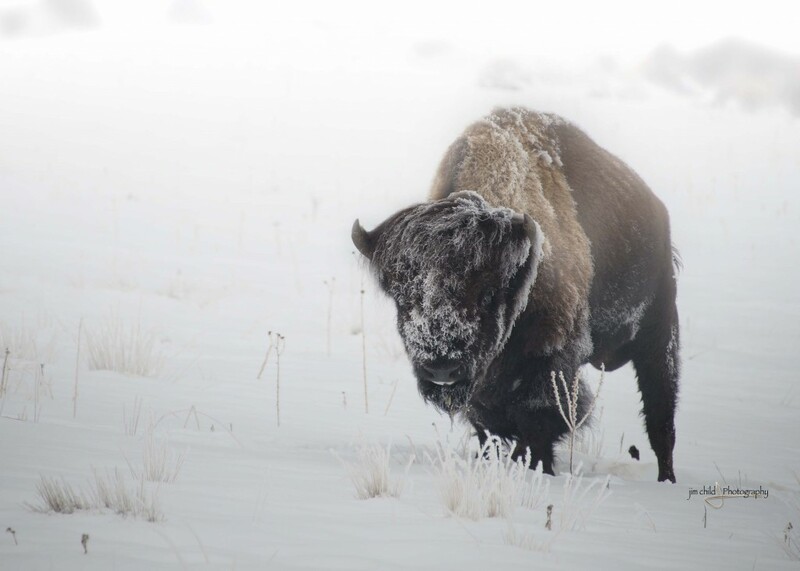 Covered with ice. About a quarter inch thick. The saucer would spin around and around. Often we would find ourselves flying backwards heading for a car, curb or wall. It was a blast. Last week we had the same weather phenomenon. Crazy slick everywhere. Schools closed. The usual 5 minute drive to work turned into 45 minutes. After work my work MOM called and said I had to grab my camera and get out quickly. She described the ice over the snow as spectacular. Soon I was out driving everywhere looking for a photographic opportunity. I really wanted to have a record of this event. My eyes saw all kinds of beautiful scenes. I just couldn’t frame them is a way that was pleasing. It was dark and late. To capture the high gloss scene there needed to be light source. Eventually I decided to frame a building with the white frosting. I found this to be a very difficult assignment. T bring attention to the extremely unique features of ice over snow was proving to be very daunting. I tried a few shots with just a reflection over the snow. It was interesting. There was no perspective. 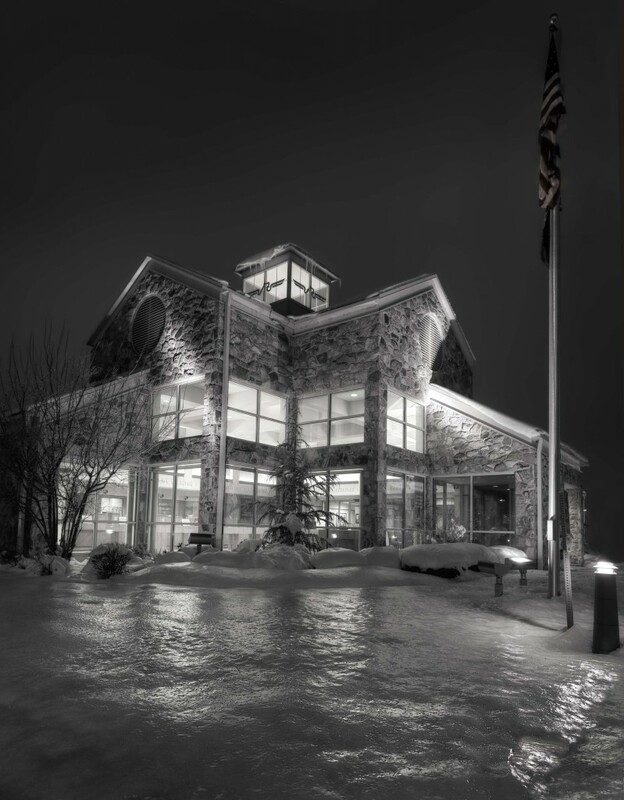 Finding an interesting building with enough snow and not to many specular lights was a problem. I gave up. Yep. Not usual for me. It was cold and the driving was treacherous. I realized that I needed some cash for a trip the following day. Off to the ATM. As I turned the corner around the bank I about crashed. What I had been looking for all night was right in front of me. Not perfection. But did the job. I now have a capture of one aspect of this crazy day! Have you ever met one of those guys that has a few more electric connections in that space between our ears. You know – the guy that when he talks you have to record his conversation so you can play it back in slow motion to understand. And look up in the dictionary all the acronyms used. Your thinking NERD right? Nope not this guy. He’s even more special. He probably wrote a book called the The details of living matter in the space of a scientific area and the characteristics and relationships of the matter therein. The crazy part is that he is normal. Beautiful wife and children. He lives in a house and not a man-cave within a garage somewhere. He loves the outdoors. Snowmobiling is a passion. And he loves science projects. How lucky are his kids? He loves them too (maybe a little more than science). I remember the biggest party at our house was when our kids graduated and we heralded a dawn of new day without science projects. Mr. H. lights up when explains and shows the details of the project. He’s a great guy. HIs kids are lucky. Nothings better than sharing thrills with your little ones. He asked me to take a few photographs for the project. Thirty minutes or so later we had about 1000. I am truly a lucky man!!! A couple of weeks of sheer fun and thrills. 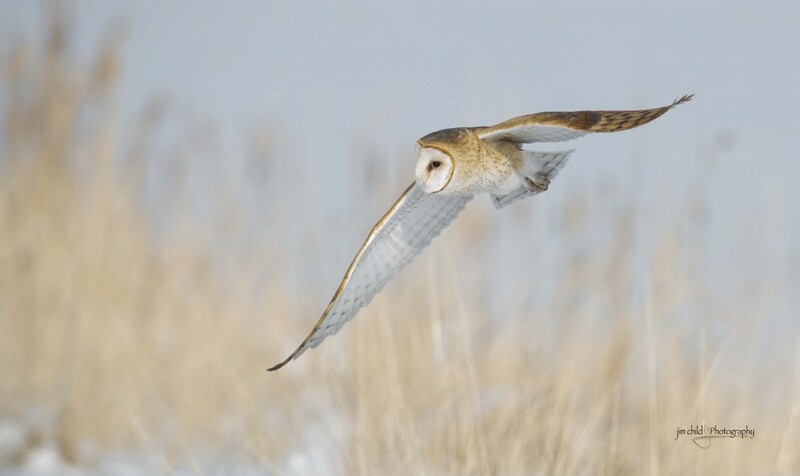 Until this year above average captures of Owls has been slim at the best. 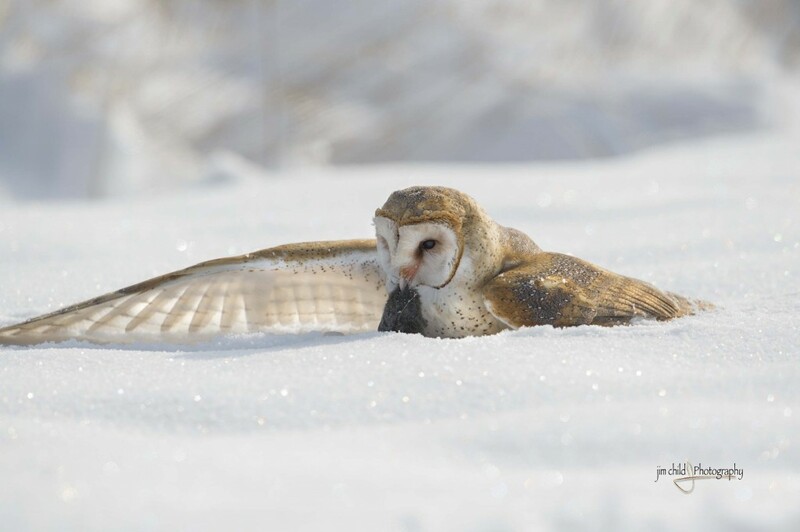 I’ve mentioned on many occasions how Owls escape my presence. Holy crap! 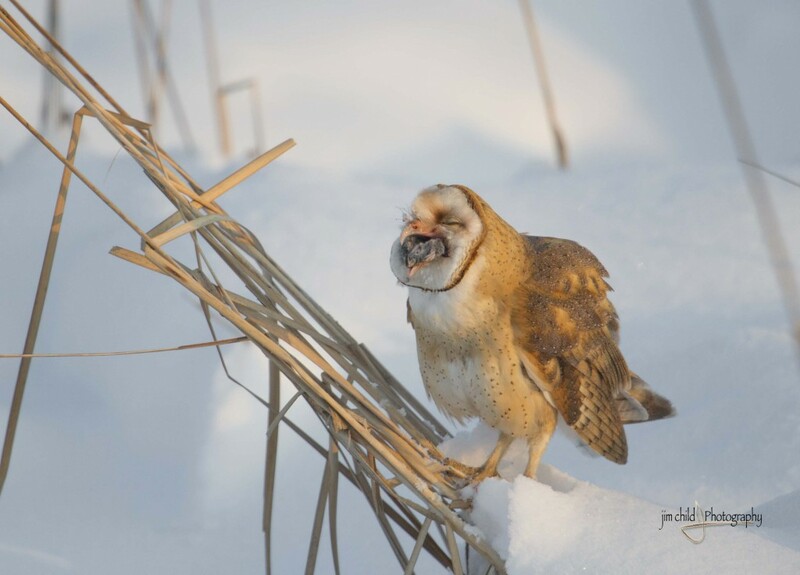 This last few weeks has been OWl mania. 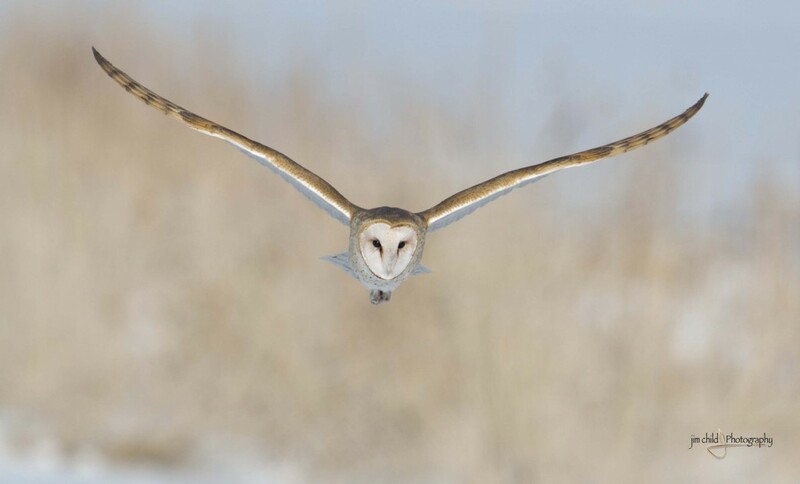 Ultra Owl. 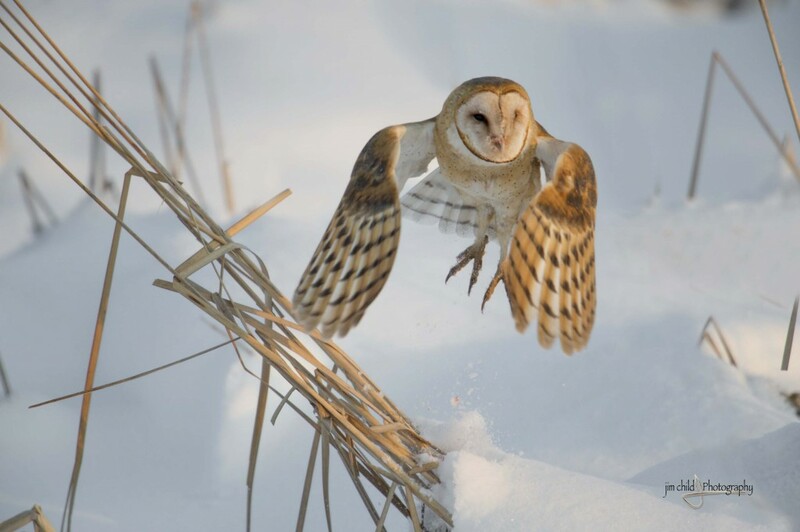 Owl extreme! A few years ago I won a Nissan Titan in a Super Bowl give-away. Honestly, recently the photographic thrills have been almost as good as hearing I won that truck. Don’t have to pay any income taxes on my photography experiences. Especially those most recent. Even my new friend smileswith me. No post trickery with the photograph above. It just cracked me up when I brought it up on the screen. Sure looks like he is smiling. Who wouldn’t be all grins with an amateur photographer all giddy taking 10 frames a second as you snacked? 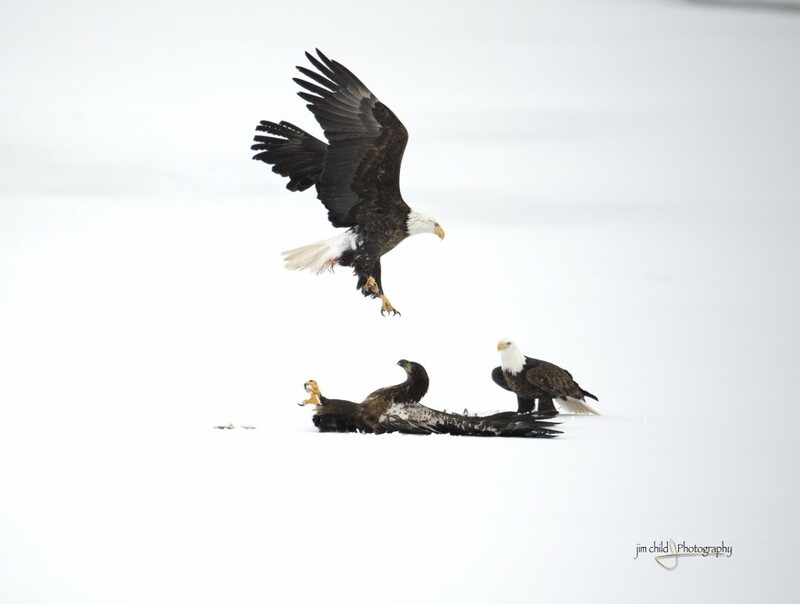 These next captures are photographs of one of his landing sites to dine. I tried yelling out to him for posing instructions. He didn’t care much. I was stuck with the natural poses and surroundings. A personal treat for me is when I can capture critters in-flight. Especially flying right at me. The most rare shots. Few birds have good reasons to fly at two legged behemoths with a huge black object pointing right at them. 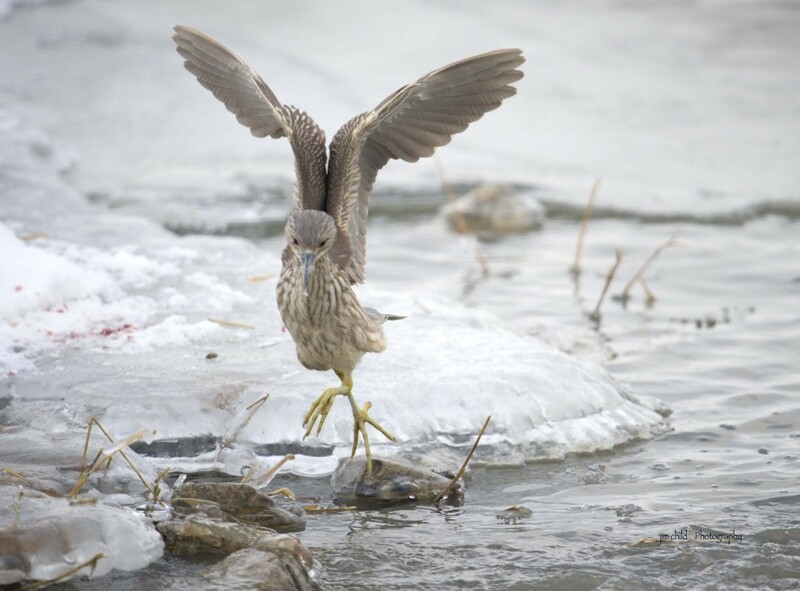 It takes a ton of luck, some skill, exceptional equipment and an accommodating bird. Hey look MOM no eyes!!!!!!! IT JUST DOES NOT GET ANY BETTER THAN THIS. 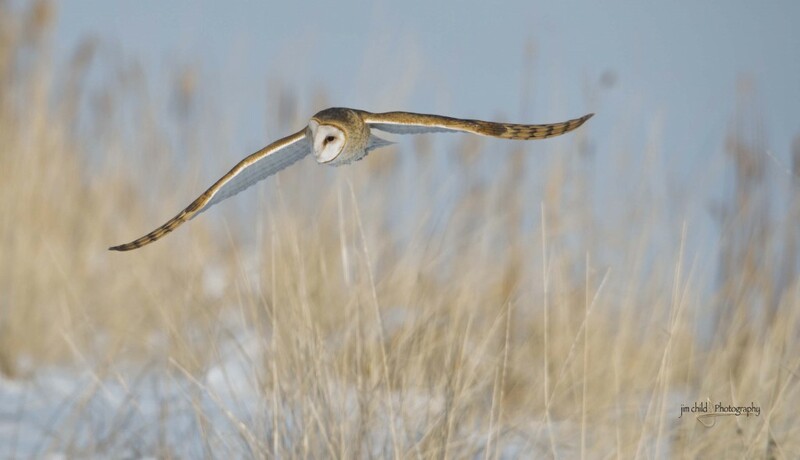 As mentioned I discovered that there are two hunting Barn Owls. Twice the fun. Twice the opportunities. 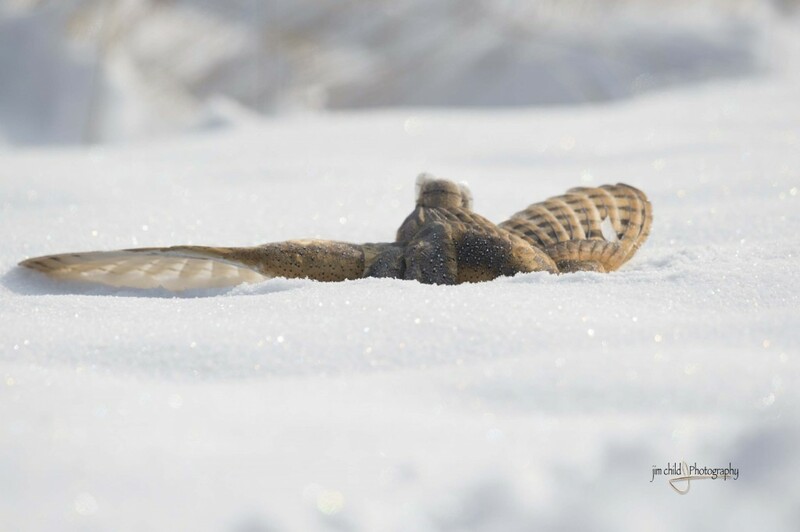 At this particular instant one of the Owls dove into the snow. It’s amazing if you think about it. 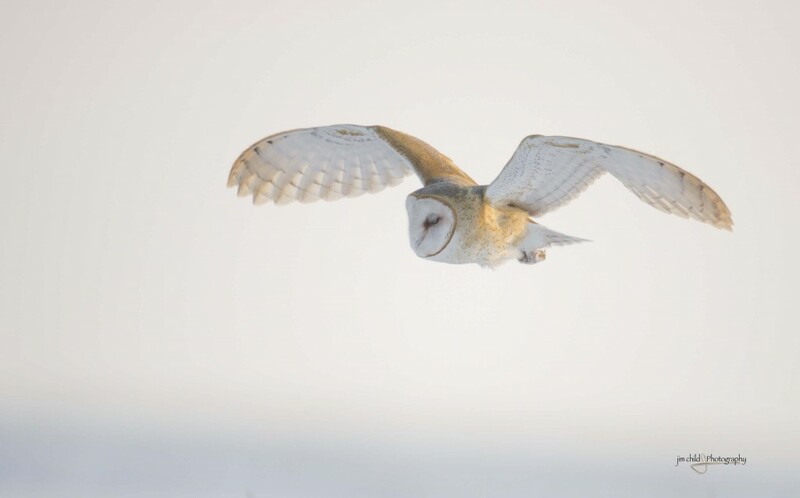 The Owl flies back and forth above the snow at the lowest 8-10 ten. He must hear the mouse under the snow. He can’t see them. 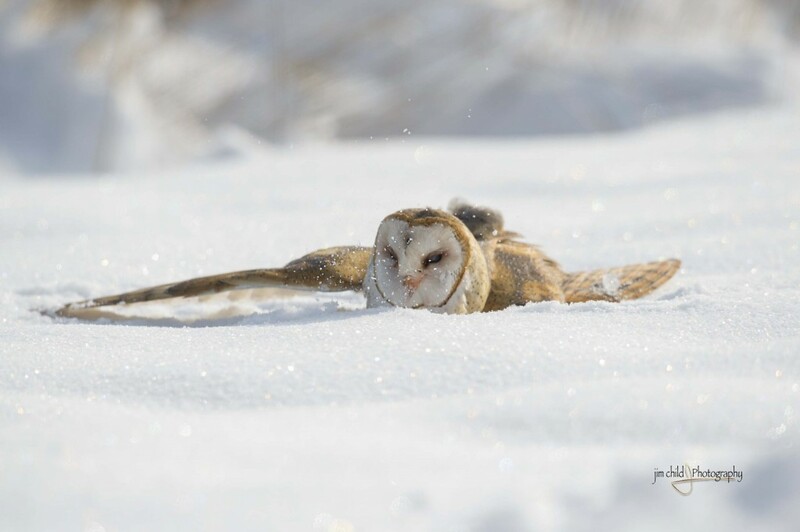 In less than a second the Owl goes from gliding to head first in the snow. 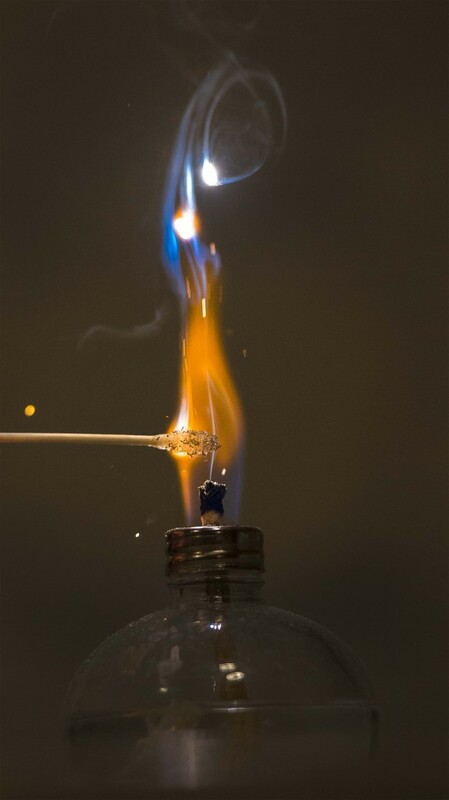 Crazy but really cool. Or in this case really cold. 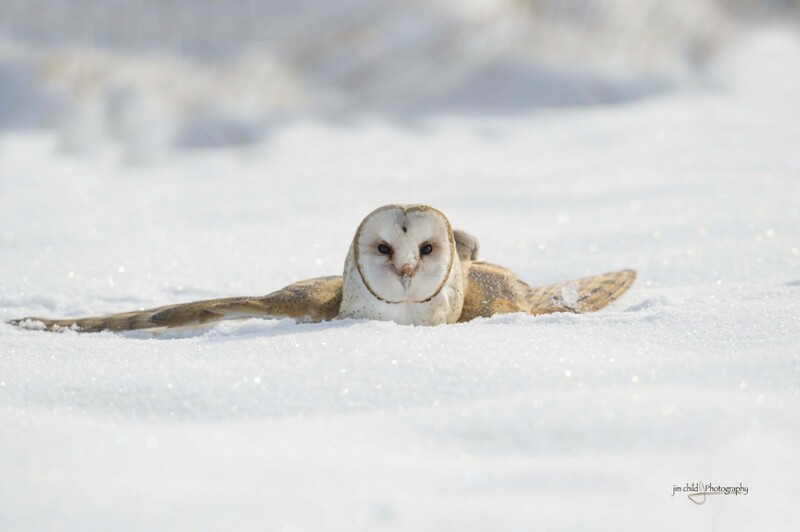 As luck would have it this week I had my camera at a low angle about 80′ from the Owl neck deep in snow. At his feet his snack. 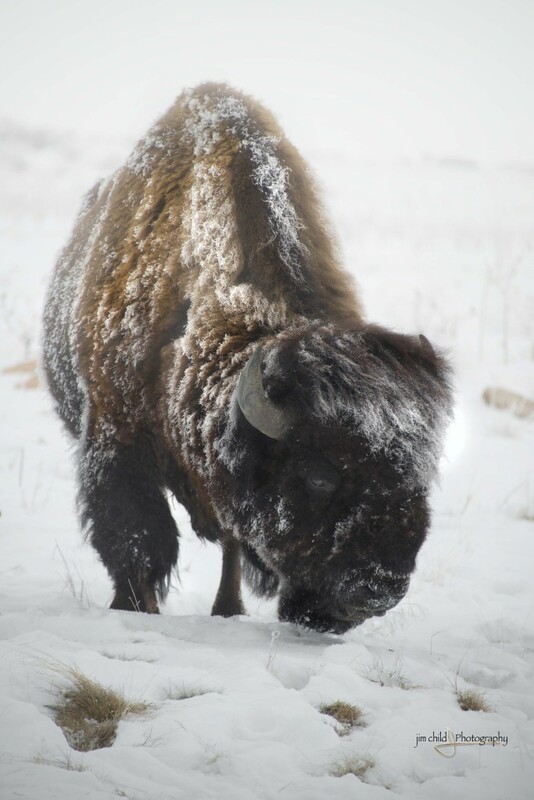 The problem…getting the snack out of the snow and airborne. He made several attempts to get the mouse from his feet to mouth. What seemed like coming up for air he would raise his head quickly and look around. Yep the fat guy with the camera is still far enough away is what he was probably thinking. A few times he would look right at me. Was he thinking – help me big fella? He seemed to trust me a little. I was out of the car. Hand holding my 600mm lens while on my knees. Gives new meaning to freezing cold. I was shaking like a liberal at a gun rally. Oh whoops sorry. Slipped in an editorial joke. 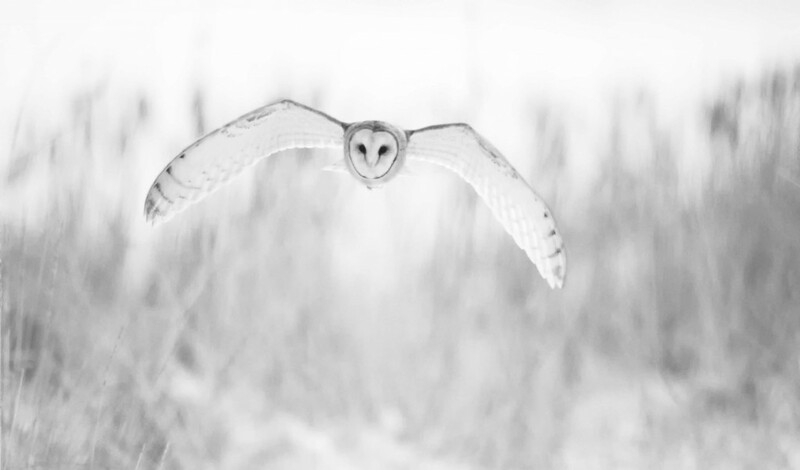 The next photograph is the only photograph I have of this beautiful Owl that is a profile. A profile showing a little more detail in the beak and facial hairs. It also shows the radar shaped face. Note again the catch light in his eye. Gives him LIFE. Eventually he was successful at bringing up the mouse. One of his snacks for the day. 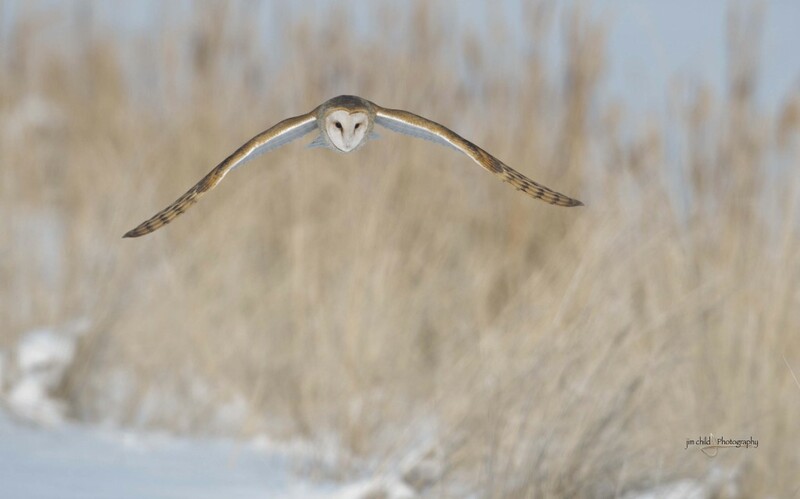 Like a whisper and as quick as a blink he was airborne. Off to gobble up the meal of choice for the day. What a beautiful late day experience. LOVED IT!!!!! It is almost as good as the Cosby show. 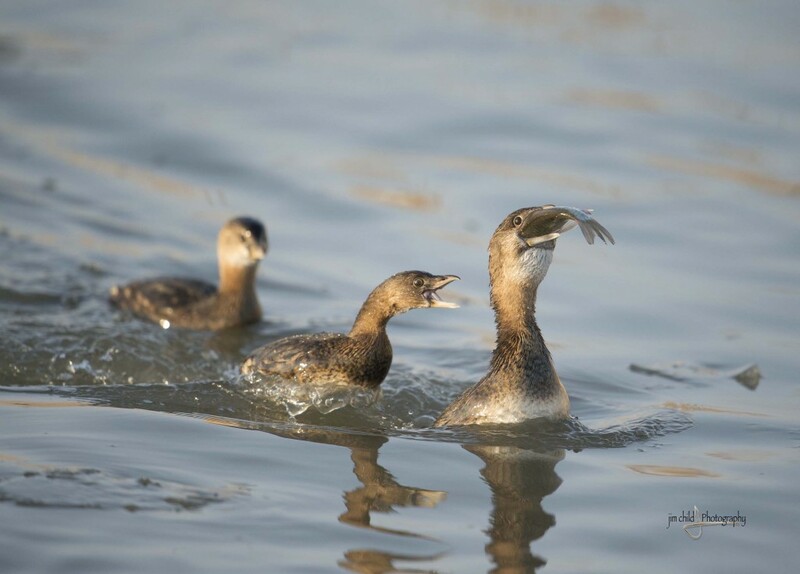 Watching the Pied-Billed Grebes is real fun. Tiny little critters than skim around and dive for fish. Not really bashful. They may allow close proximity as long as you stay in your car. 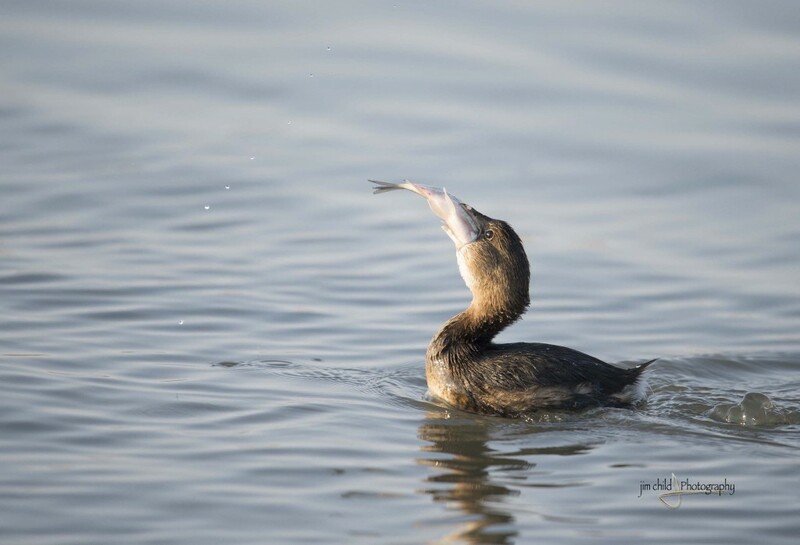 The best show is when a lucky Grebe brings up a fish. The fish being just a bit to large to swallow quickly. It takes some time and effort to get get down. 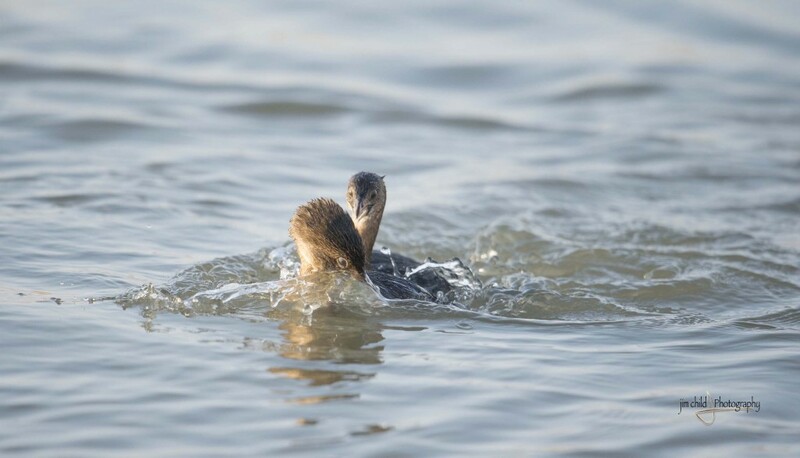 As usual there is always that pain in the neck, selfish Grebe. The Grebe will steal for himself. 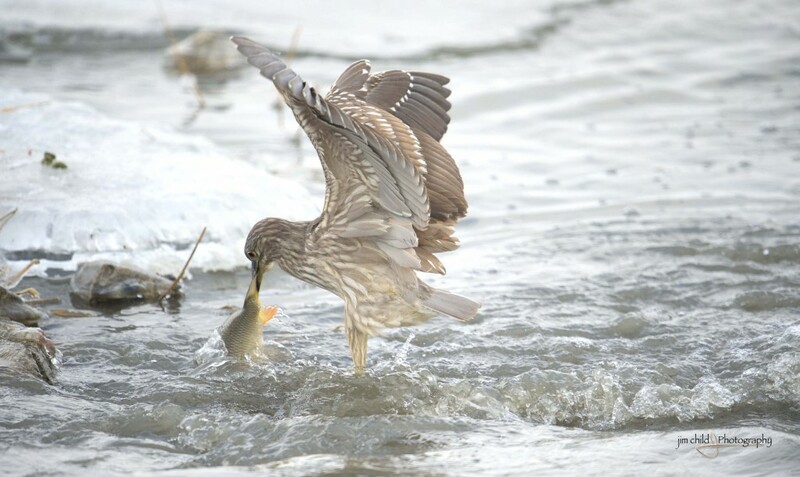 One sure way to insure the fish cannot be swallowed is or the Grebe thief to do the famous GREBE choke hold on the Grebe with a mouthful of fish. 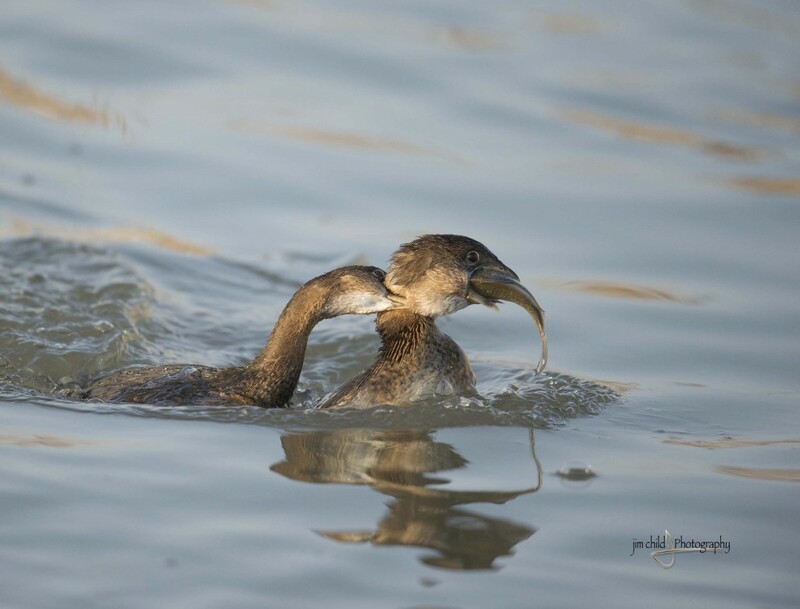 With some endurance and a little size advantage the lucky grebe eventually swallowed the fish. Catch Me I May Faint! My Wife is my best (worst) critic. 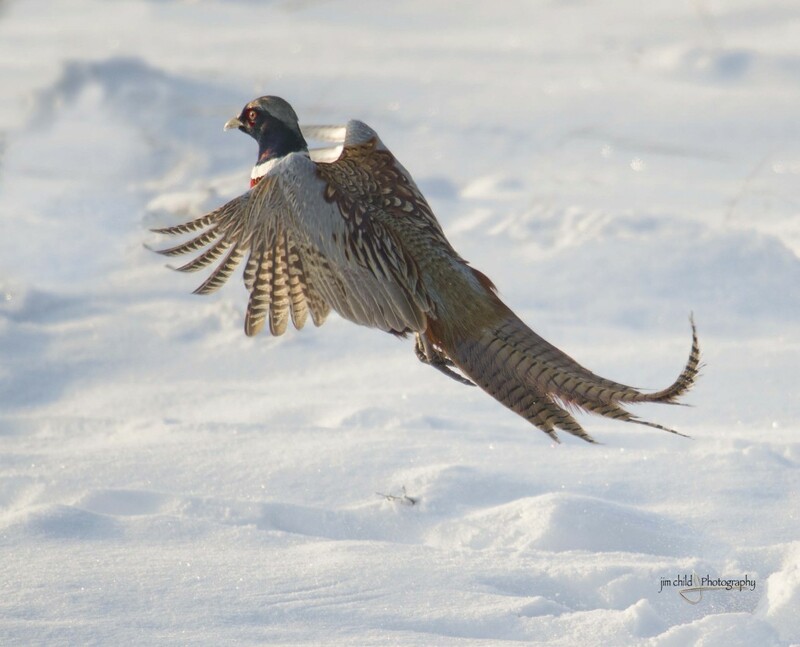 The one thing I look forward with winter photography is the Pheasant and it’s beautiful colors. Against a white backdrop of snow the male Pheasant colors have an incredible luminance. The snow acts as fill light. It’s hard to get a bad shot of a Pheasant. If luck is on your side. If your as focused as a single cell under a microscope. If you have a very long lens. If you have a very fast firing speed on your camera. If your lucky. 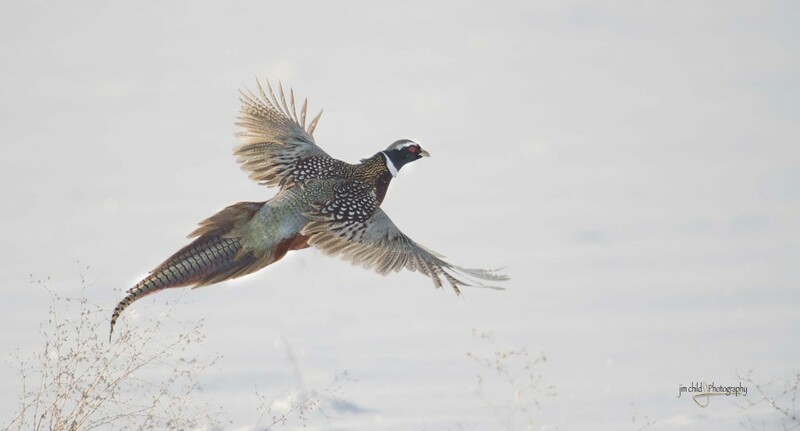 You may be able to catch a pheasant in flight. I was very lucky! This day I sat quietly and still. A gutsy Pheasant came within about eighty feet of my camera. The light was almost perfect for a close capture. The smart little brat soon realized that I was not a mannequin of a whale rather that I was one of his two legged enemies. 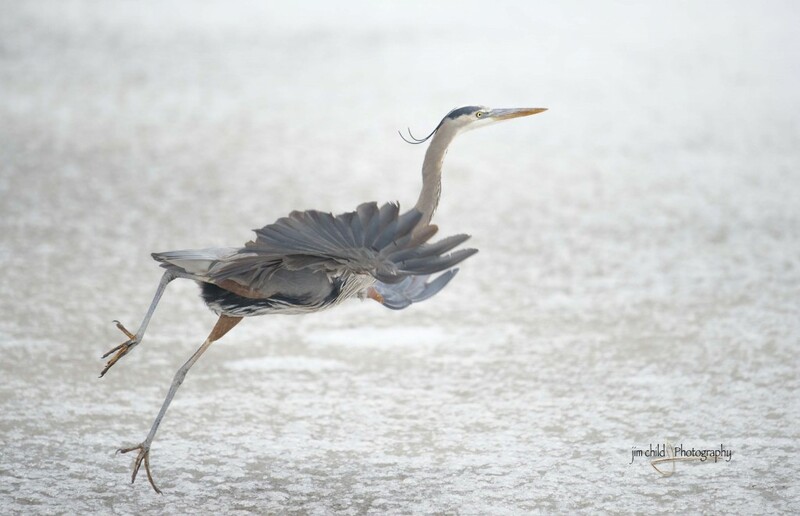 As he ran back and forth I was fortunate to capture him running both directions. 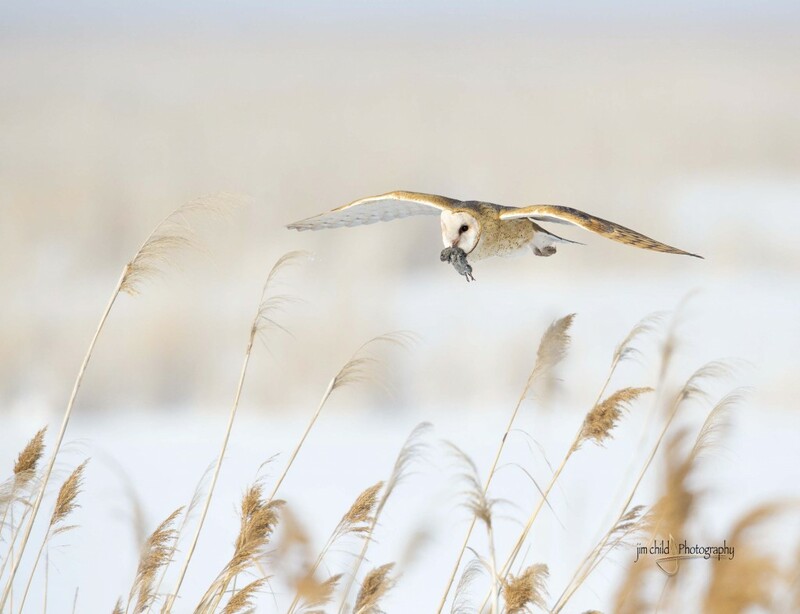 Note in the two photographs above the difference in the eye of the Pheasant. There is a catch light in the one where the Pheasant is running towards the late sun. 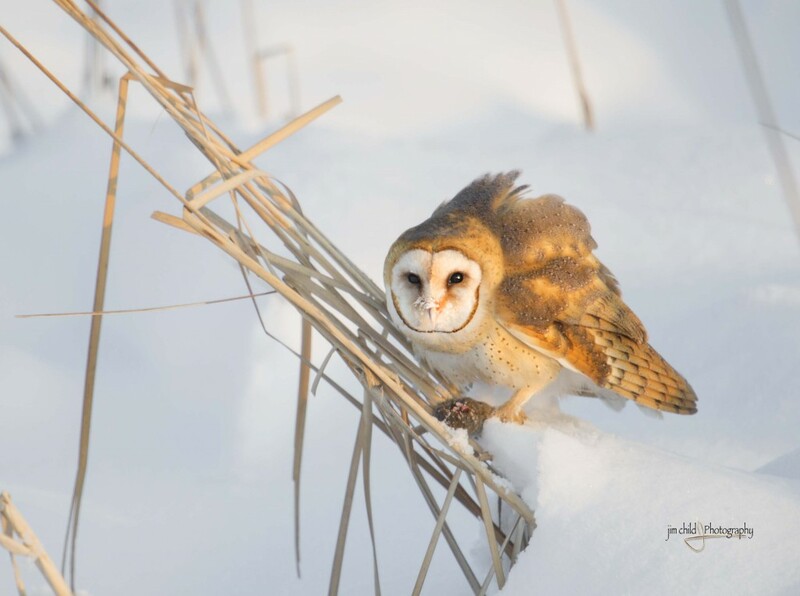 In wildlife this can make or break a great photograph. The catch light gives life to the animal in the final capture. Now to my worst critic. I have carried a camera around for about 30 years. Carried is the key word. Yet in those 30+ years I have taken many hundreds of thousands of photographs. Easily a million. What’s my odds of getting a positive nod from my worst critic from over a million photographs. Zero. Zip. Not one. She came into my man cave to inform me that dinner was waiting. I was narrowing down the photographs of the Pheasants. On my Wacom was the following photograph of a Pheasant. One of those lucky shots I keep talking about. A photograph I dream about and hope to capture. It would be better if he was flying at the sun. 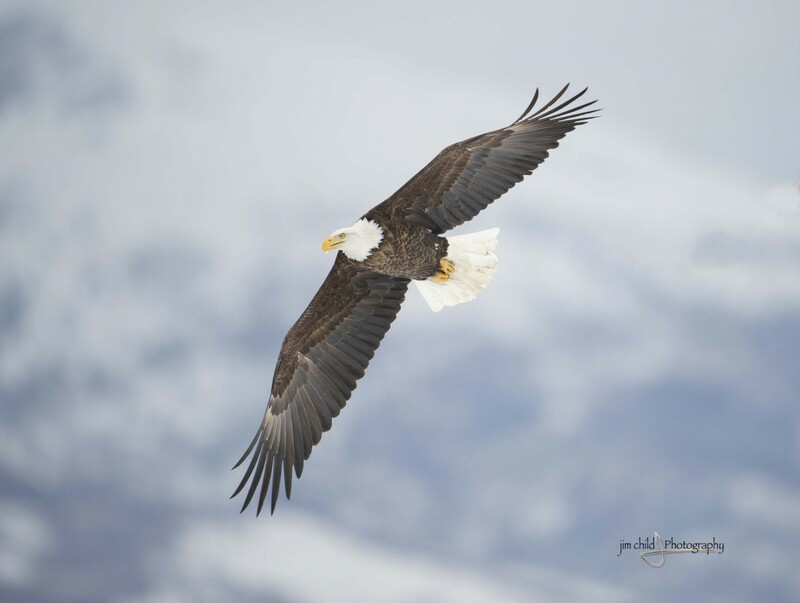 This particular capture has the details of the feathers as his wings and tail are spread in flight. With a very quick quip she said “I love that shot”. For a moment I thought of needing smelling salts. I stared at the screen and wondered if my mind was playing mind games on me. It was like my first kiss. Ok my second or third kiss. Anyway this was proof that everyone has a threshold. An internal, genetic way to see life. To like or not like a photograph. I may print this photograph and carry it in my wallet to remember this day…….. Love Ya Honey! I’m telling you it has been a crazy month so far! Work has been insane. I have spent more time with attorney’s than I would like. Way more time. A few minutes is too much with an attorney. Good people. I like them and have great respect for their knowledge and persistence. Man do they see the world differently than the rest of us folks. And I think the term “Micro Manage” is latin for attorney. Holy crap! If the world was ran by attorneys nothing would get done. Enough with the attorney comments. These last few weeks being so stressed has caused me to spend extra time at Farmington. It’s my escape time to meditate and get the voices out of my head. I am amazed at the photo opportunities while there in the morning and in the evening. 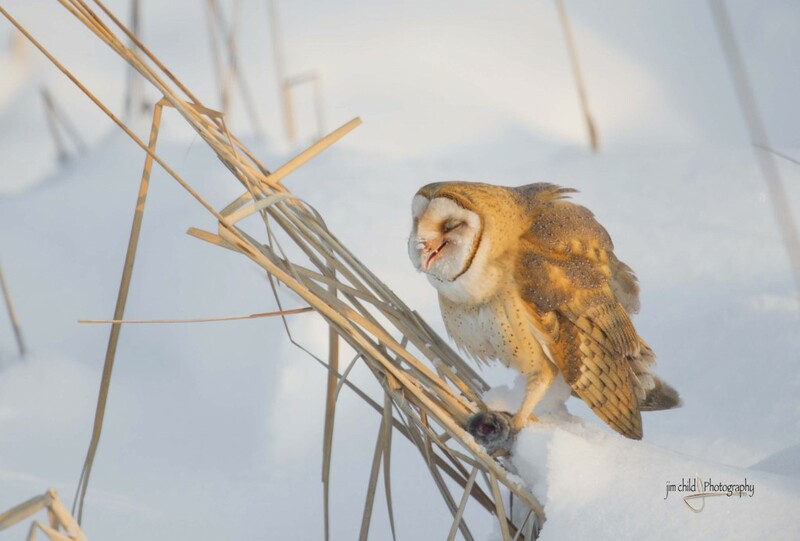 I found that there are actually two Barn Owls spending a lot of time hunting on the dikes. The pheasants are out in numbers. And I captured a new friend. 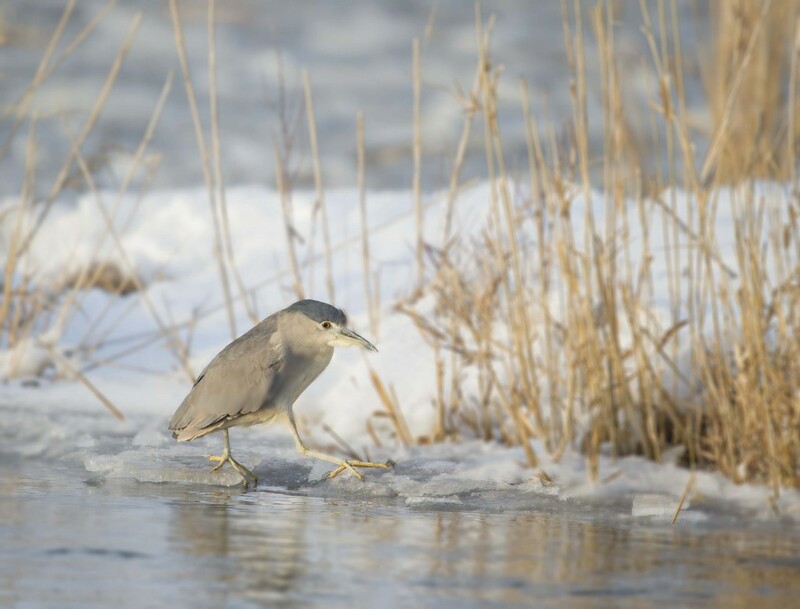 This is the adult Crested Night Heron I photographed yesterday. I spent about an hour with this juvenile and was laughing hilariously the whole time. It truly was a lesson in self taught fishing with all it’s (missed) givings. 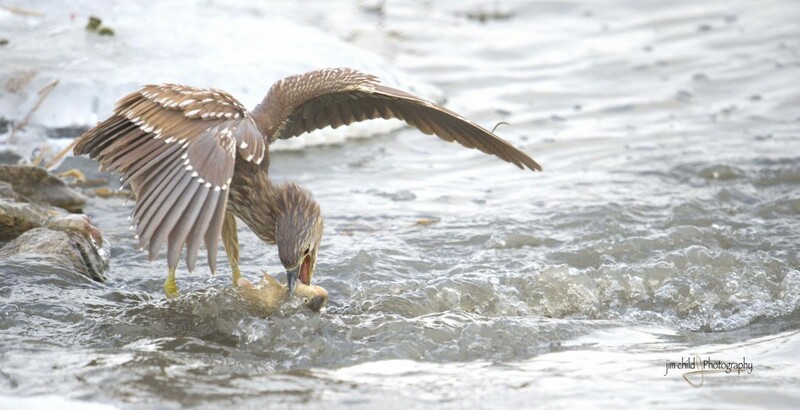 The juvenile would chase the fish as they passed down the river. Most were chases not capture. His inexperience was evident. And humorous at the same time. 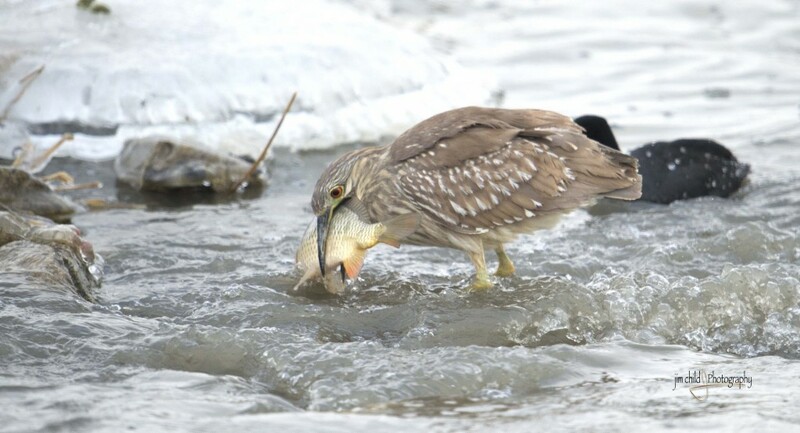 The best part was this youngster would catch a few fish that was too big to ingest. The eyes are bigger than the stomach issue here. 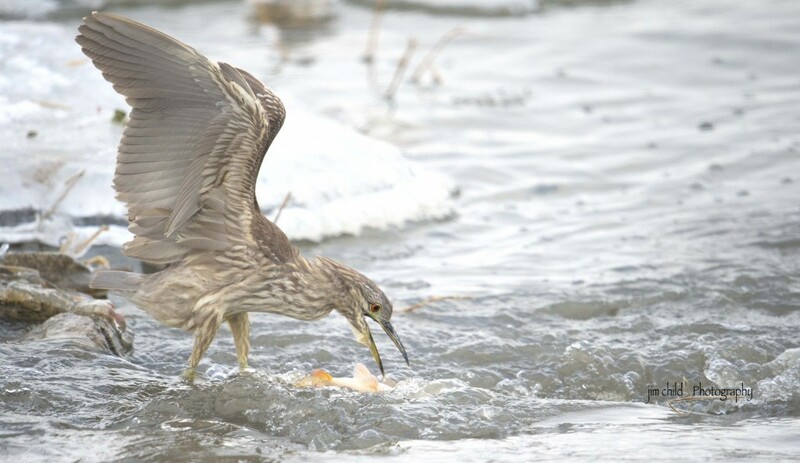 Since these birds swallow the fish whole the eyes were bigger than the mouth. I mean really too big. I must have shot several hundred frames of this juvenile. Looking through all the captures takes me right back there. Smile and all. 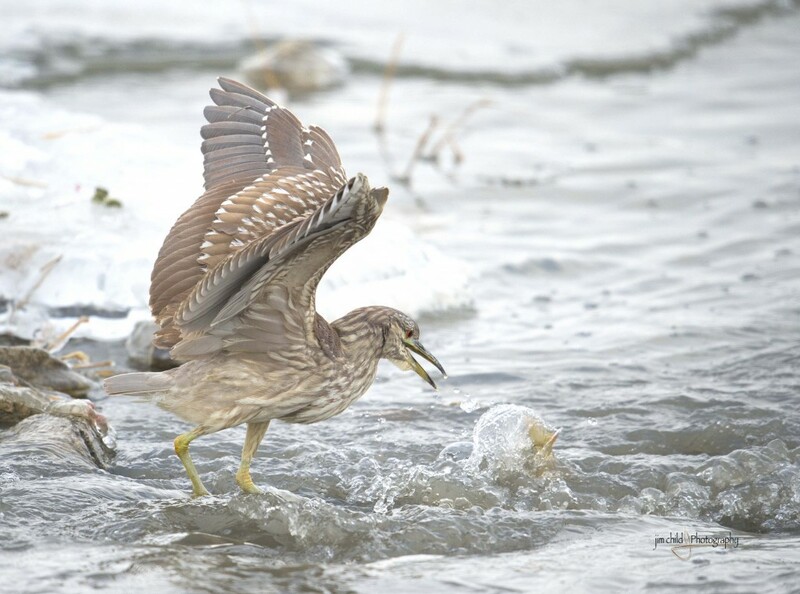 In the end this Crested Night Heron did catch a snack. Even if it was by the tail. The temperature has been in the teens for days. Had to go to the island to get proof. My luck never seems to end. Today for my b-day I left a couple of hours early to look for my Owl friends. As previously posted a ton of Harrier Hawks. No Owls. 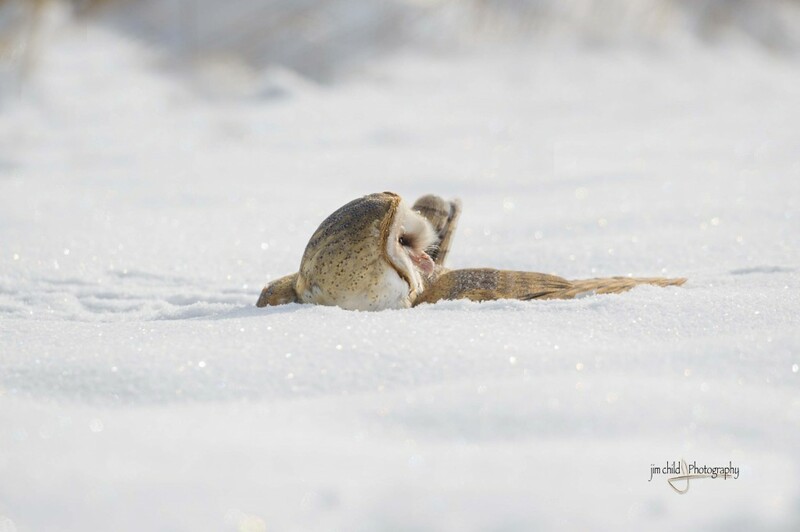 I did find however a dead mammal that made for some real fun captures. 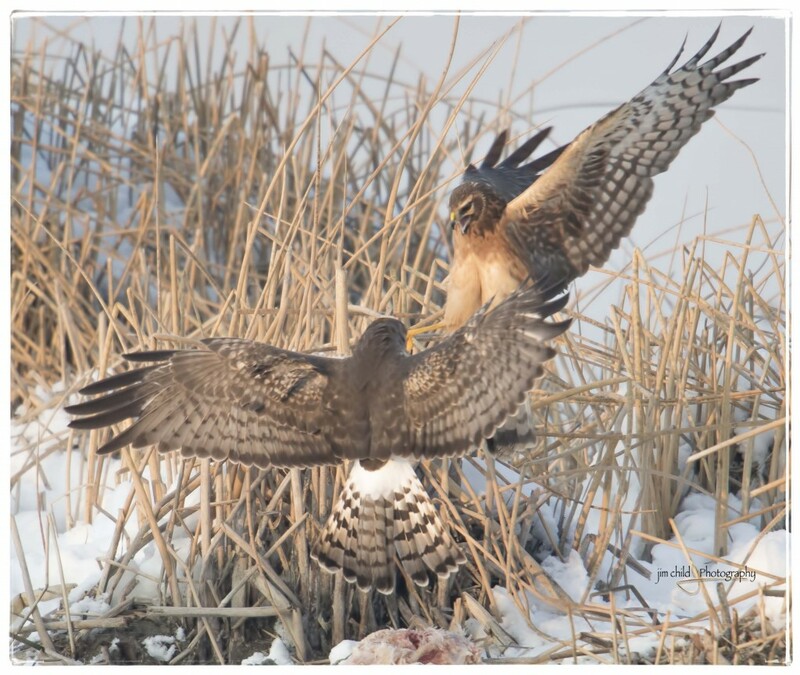 Hawks in pretty good numbers fighting over the snack. It would have been tons better without the clutter of all the rush around them. Beggars can’t be choosers. Shot at ISO 5000. Ran through NIK Define noise reduction.